Wabash College is prominently featured as part of the Indiana Historical Society’s annual “Festival of Trees,” which runs through Jan. 5. The Wabash tree is one of 80 meticulously decorated trees packed into the four floors of the IHS’ main building as a joyful expression of the holiday season. The festival features a 30-foot tree fashioned in an Indiana theme. Located on the fourth floor, the Wabash tree sports a block W at the top, while a white ribbon with a red “Wabash Always Fights” message drapes the tree. 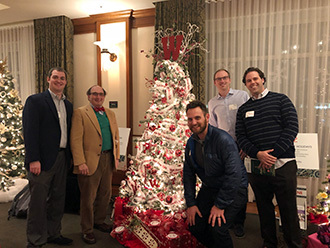 At the tree's base are wrapped boxes representing the great gifts that Wabash gives to its students: responsible citizenry, gentlemanly conduct, critical thinking, and effective leadership. The Wabash decoration committee included Elaine Engledow, Melody Grand, Lisa Kolisek, Leigh Rudicel, and Jon Pactor '71. More than 20,000 people experience the Festival each year. A public vote will determine the festival’s favorite tree. The Festival of Trees is presented by The Salvation Army with support from The Mothershead Foundation. The IHS (450 W. Ohio Street in Indianapolis) is open from 10 a.m.-5 p.m. daily except Tuesday (10 a.m.-8 p.m.) and Sunday (noon-5 p.m.). Admission is free for IHS members and children under 5. Adults (18-60) are $9, and senior citizens (60+) are $8. Children (5-17) are $5.